In just two weeks’ time it is my son Skater’s 21 st birthday. How time flies. He is a chocoholic and all he wants is to get immersed in chocolate. Lucky for him that is going to be easy because on the 12th and 13th of September there is a whole weekend devoted to chocolate in Sydney. It’s the Smooth Chocolate Festival 2015. Sydney is a great place to visit, but imagine pairing it with a chocolate festival? In excitement and anticipation I’ve created a do it yourself chocolate fondue kit. It’s serious fun to share and it’s easy. I have no idea if a similar survey has been done in Australia, but according to a US survey 53% of Americans turn to chocolate instead of a friend when they are sad and 70% of them believe chocolate’s health benefits justify eating it. The list of chocolate professionals and pastry chefs for this years festival is enormous and includes Adriano Zumbo & Anna Polyviou (Executive Pastry Chef of Shangri-La Sydney), as official ambassador’s. 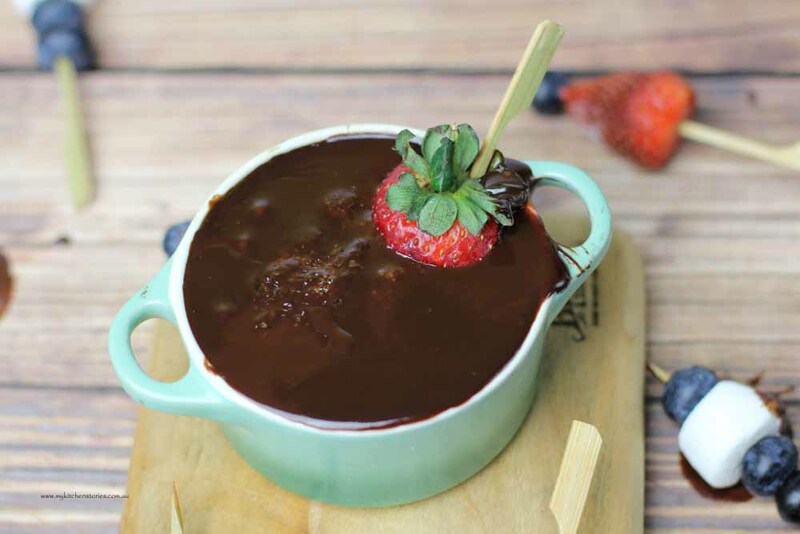 That means demonstrations, classes and tastings of desserts and chocolate around every corner of the Rocks …. There’ll be a small village of chocolate festivities in the park outside the Museum of Contemporary Art. The Smoothfm tent will be serving Chocolate platters and champagne. There will even be an extreme Tim Tam tent. ( I am thinking Tim Tam towers and Tim Tam cakes). There’s even going to be Chocolatiers Quarters on Playfair Street with chocolate show pieces made by Adriano Zumbo and Jodie Van Del Velden. (Josophans). 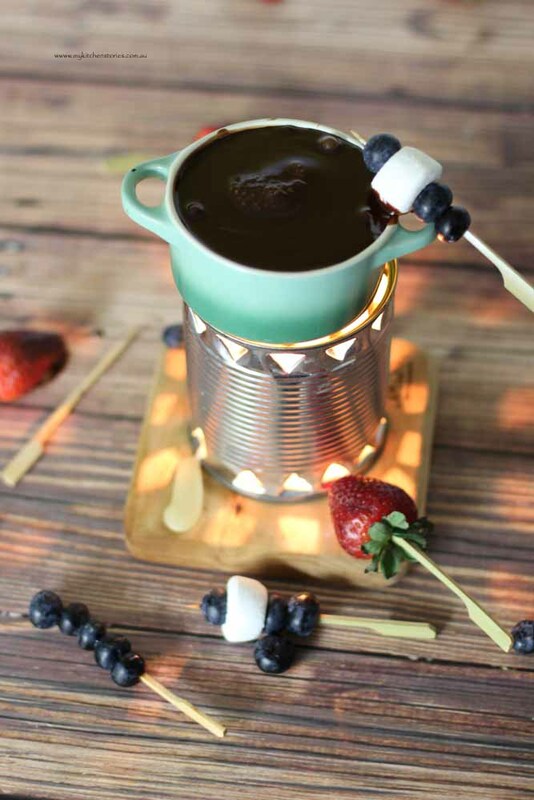 You know what, meantime I’ve made this really cute little do it yourself chocolate fondue set out of a can and a candle and it is so much fun. (and delicious). You can start dipping. Yee ha! 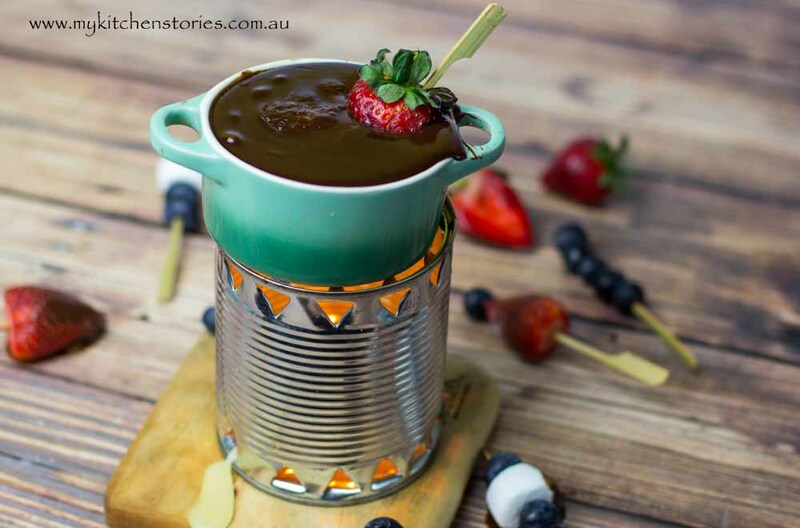 Excite the family with your very own DIY chocolate fondue. 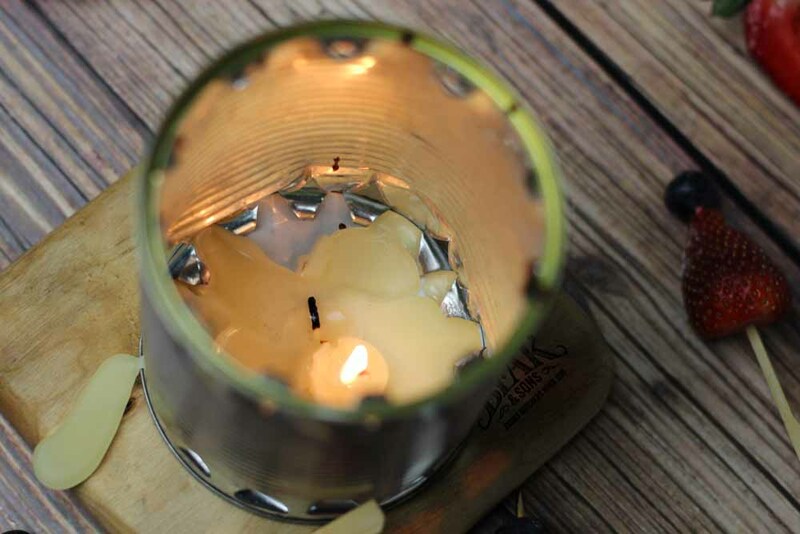 After you prepare the tin and the candle, set it aside to light when the chocolate is ready. Make sure the candle is not long enough to touch the bottom of the chocolate. Make up your fruit skewers or simply put a platter of fruit and the skewers out ready to help yourself as you go along. Put the cream and chocolate into a microwave bowl and set for one minute. Stir till the chocolate is melted. If necessary return to the microwave for 20 second stints and stir till smooth. Do not overheat. Alternatively melted in a bowl over hot water. Pour the chocolate into your heatproof dish and set it over the flame. I think more places need chocolate festivals! I hope you enjoy it and your son has a great birthday celebration. Happy birthday to Skater! Will you be doing a big party for him? Yes he needs to cellebrate….yay! Happy Birthday wishes to your son. The chocolate festival sounds like it would be a lot of fun. 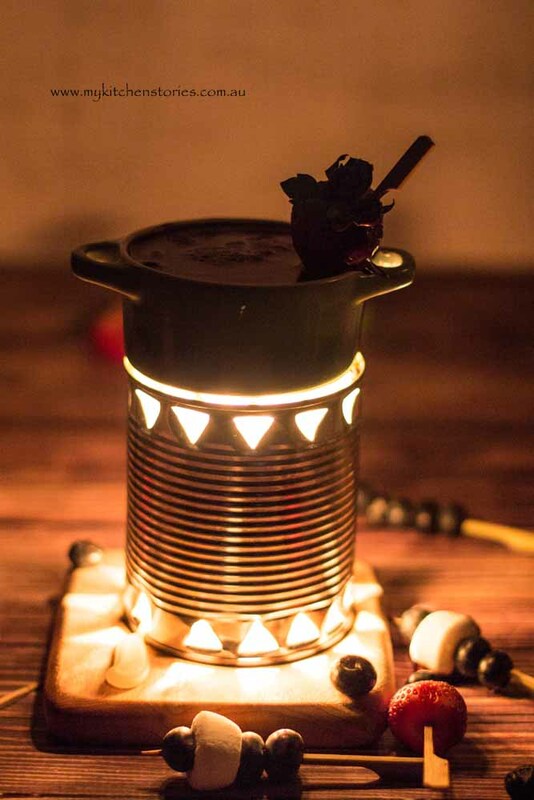 Love your take on fondue. I’ll have to give that a try. I want to lick that cup of melted chocolate clean! I can imagine that too Joanne! Oooh, cool!! What a festival! 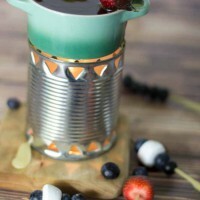 And what an AWESOME way to serve up chocolate fondue, I love the DIY light holder!! One of my husband’s favourite desserts :-)) A birthday celebrated with lots of chocolate would be really cool! 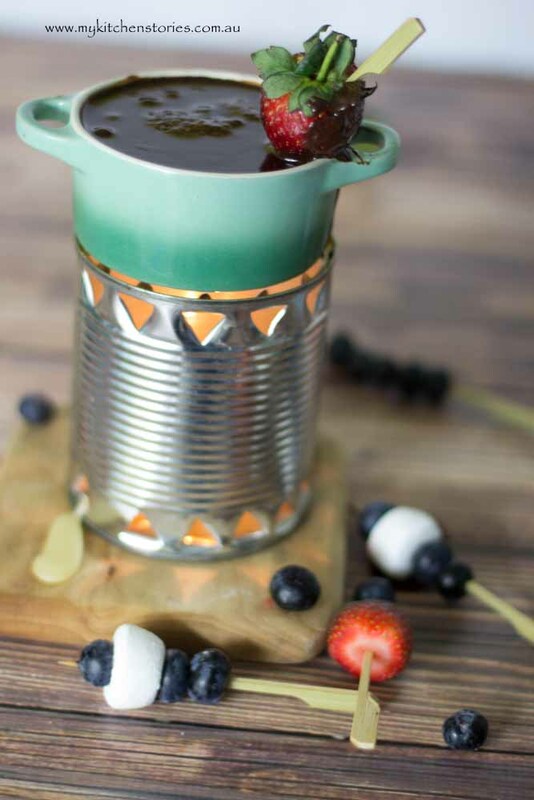 Clever idea to use the tin for the fondue. Wish I was in Oz this weekend…I would so be at the chocolate festival. Have fun!! A chocolate festival? What fun. Not in the budget this year but I’ll be there in spirit. I’m going to make this fondue!